To not coin a phrase: It’s the economy, stupid! And this time of year at the end of the holiday spending cycle, which has left some of us perhaps feeling a bit remorseful. That does not account for the abundance of hot dog places opened and opening around town. But it does explain why they’re a particularly sensible dining option right now. And so we present two hot dog places near Metro — all the better to save money on gas and parking. One is tiny, modest and cheap and the dogs are delish. Skooby’s in Hollywood sticks with the basics: chili cheddar dog, bacon cheddar dog and garlic lovers dog (if you’re not going back to work). The only oddity is the quesadilla dog, which as you might guess is a grilled quesadilla with hot dog chunks inside. The fries are a mixture of regular fries and thick potato chips and they are yummy. On a low-carb diet after holiday indulgence? Order them anyway. Do not go expecting a place to relax. There only are a couple of tables indoors and a counter outdoors. What you can expect is a good hot dog with a snappy casing at a good price: $2.69 for Skooby’s Original and $2.95 for fries. Vegan dogs are available. Skooby’s is in the heart of Hollywood at 6654 Hollywood Blvd., a few blocks east of the Metro Red Line Hollywood/Highland Station. And Metro 212, 217, 222 and 312 buses go right by. Fancier by comparison — shall we say date material, although not first date — is the relatively new Dog Haus Biergarten in Old Pasadena at 93 E. Green St., a block from the Gold Line Del Mar Station. 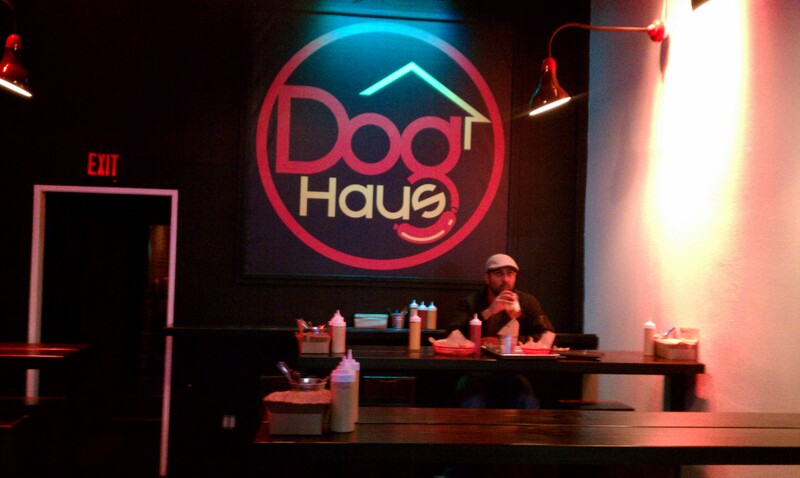 It’s the sister place of the Dog Haus we posted on previously at 105 N. Hill St. in Pasadena. For lunch start out with the Downtown Dog wrapped in smoked bacon with mayo, mustard, ketchup, sautéed onions and peppers or the Little Leaguer dog with chili, diced onions, shredded cheddar and Fritos (!). 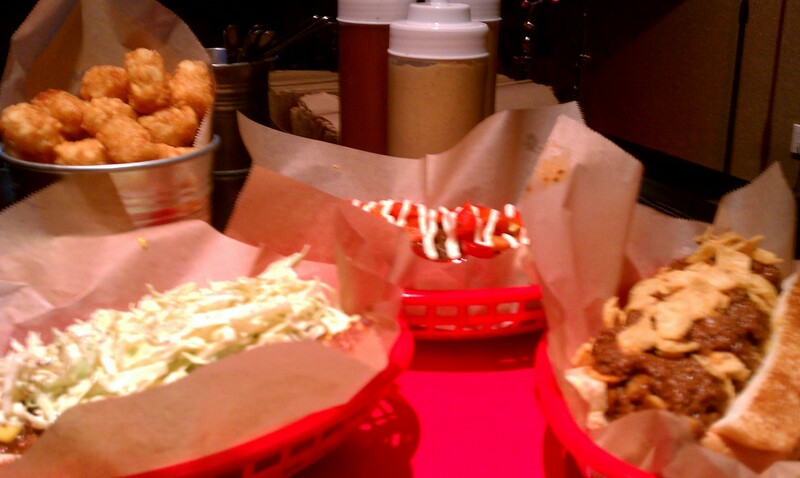 Or try Reservoir Dog with chili, mustard and coleslaw. (All three pictured at top.) But there are dozens of other combinations, all served in a comfortable picnic table décor, with seating inside and out. Dogs come on sweet King’s Hawaiian rolls — another justification for carb consumption. Dogs are mostly $5.95, although kielbasa and Italian sausages run $6.50. They also have burgers and veggie dog alternatives. And as the name implies, the Biergarten serves craft beers. No problem, if you’re going Metro. Any other dog suggestions? Let us know.